The deeper we go into 2017, the more chaotic the world appears. Today, the only thing most people can agree on is that the train of human society is derailing and the driver seat is empty. Donald Trump is struggling to set his administration in motion against loyalists of the previous government in the media and the judiciary system. Even in his own party, Trump is battling criticism that sounds as though it came straight from a Bernie Sanders speech. In Europe, the UK has begun the Brexit process, no one is certain about the results of the breakup, nor is anyone certain about the desired direction for the EU. It appears that the leading trend in the political arena is “each country for itself.” Brexit is underway, Trump’s policy is “America first,” Marine Le Pen in France and AfD in Germany are garnering support, and the majority of Swedes are supporting a Swexit. Yet, if the EU falls apart and each country must fend for itself, who will be the responsible adult calming things down when conflicts arise? In such a state, the distance between a relatively minor dispute and a full-blown war could be a matter of days. Nobel Prize laureate in physics Dennis Gabor wrote in 1964: “Till now man has been up against Nature; from now on he will be up against his own nature.” Indeed, for several decades we have been technologically capable of providing every human being with every basic need in order to sustain ourselves. If we wanted to, we could provide everyone with fresh food and water, adequate sanitation, electricity, communication, and education. The problem is that we have no desire to do so. Our hatred of each other is causing the most technologically advanced era in human history to produce the most widespread hunger since World War II, which in itself was the most satanic display of human hatred. Everything around us, including our own bodies, is the outcome of different, often conflicting forces, organs, and vectors complementing one another to create the universe we live in and of which we are a part. Each part in the web that is our world contributes its share to the stability and prosperity of the system that is our world. Moreover, the higher up the evolutionary chain we climb, the more complex system of interconnection and interdependence we find, requiring a higher level of communication and connectedness among the parts. It turns out that our alienation from each other is causing our personal, social, and global crises by attempting to go against the connected nature of reality. In fact, that tension between our isolationism and narcissism vs. the connectedness of reality has grown so intense that in all likelihood, it should have snapped by now. We view the global wave of terrorism as a tragedy, but for all its tragic consequences, terrorism is a way to vent ethnic and religious hatred in less injurious ways than an all-out war. Yet, clearly, this type of “pressure-relief-valve” is unbearable and unless we hurry to decompress this time bomb, it will explode in an all-out war. The more we develop, the more connected and interdependent we become. Ironically, our narcissism is driving globalization even faster because it makes us want to exploit everyone for our own benefit, and therefore compels us to connect to other people even more tightly than before in order to use them. Yet, since our narcissism grows as well, our forced connection is becoming so painful that we are losing our ability to connect to one another properly. We either avoid connection altogether through suicide or substance abuse, or attack it by being abusive, aggressive, and sometimes even homicidal. The Brexits brewing the world over are necessary adjustments to ease the pressure of our forced connection. Romano Prodi, former Italian Prime Minister, correctly concluded that “The EU has no strategies and there is no leader to follow. The Europe I dreamed of is dead.” He was also correct in saying, “Whoever leads a political coalition and a group of countries must consider the interests of all the members.” Since this consideration is clearly not the situation in the EU, it must be taken apart before it blows us all to pieces. Despite the need for temporary separation, in the end we will have to join nature’s course and connect. Proper connection will be the next great challenge of humanity. Our “final frontier” is not space, as we thought back in the 1960s. Our final frontier is our connections with the people with whom we live. Our connections with the people around us and the connections among societies and countries will determine the fate of humanity. The first step toward building a sustainable society is to understand that whether we like it or not, there is mutual responsibility between us. In the 1930s, the greatest commentator on The Book of Zohar, Rav Yehuda Ashlag, wrote an essay titled “Peace in the World” where he observed that we are all interdependent. In his words: “We can no longer speak or deal with just conducts that guarantee the well-being of one country or one nation, but only with the well-being of the whole world because the benefit or harm of each and every person in the world depends and is measured by the benefit of all the people in the world.” What was true in the 1930s is far more so today, but we have yet to come to terms with the fact that mutual dependence implies mutual responsibility. Once we understand that our problem is our separation and mutual hatred, we must strive toward the opposite. When we Jews united at the foot of Mt. Sinai, we were immediately tasked with setting an example of unity so the world could unite, as well. In other words, we were commanded to be “a light unto nations.” We did not know how, but we were willing to try. This is all that is required of us today. We Jews are at the forefront of science, technology, and finance. Yet, what the world needs is for us to be at the forefront of connection. As Mr. Spokoiny said, “The collapse of civility is not just a Jewish problem. We as Jews are like everybody else, just a little bit more so.” Yet, we as Jews are the only ones who are expected to be a role model of unity and civility, and not an example of the opposite. The severity with which the UN judges Israel compared to all other countries in the world combined is not merely an expression of anti-Semitism. Underneath the hatred lies the expectation from the Jews to be “a light unto nations,” meaning to lead the world in the opposite direction—from hate to love. When that expectation meets the harsh reality of our separation, it results in anger toward us, which then turns into hatred. We call this anti-Semitism. What flames it is not whether we are leftist globalists or hardline conservative isolationists. Rather, its fuel is our treatment of our coreligionists, regardless of their political or economic views. We must use every opportunity at our disposal to try to reverse the trend toward isolation. Next week, as we sit around the table during the Seder and talk about freedom, let’s talk about freedom from hatred. Let’s really think about what it means to be “a light unto nations” and why there is anti-Semitism. 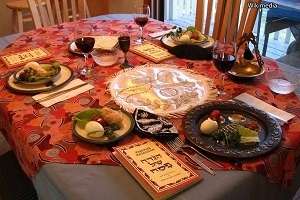 If we do, this may very well turn out to be our most meaningful and memorable Passover night, ever! Just last month, EU President Antonio Tajani stated before the EU Parliament: “Today more than ever we need show that these challenges can only be overcome if we are united.” Everyone understands that unity is imperative, but only our nation has a hidden key to make love cover all crimes, as King Solomon put it. If “the act comes before the understanding,” as Ashlag wrote, then let’s act on unity and see what it produces. Whatever happens, if we aim for unity, we can’t go wrong. #Pesach (Pe-Sach) is the transition from the ego governing us to redemption (escape) from it, liberation from ego that brings evil & strife. #Socialism is the socialization of industry. Not by the working class, but by all society, spurning profits. This isn’t Marx, but Kabbalah. Marx knew that Adam Smith’s idea would die, as markets are limited to Earth. Marxism describes the end of #capitalism , socialism comes next. The #Stockholm terror attack shows that the terror is against everyone, and only correcting the general ego with Kabbalah will weed it out. Question: Exactly on which desires is it necessary to make a Tzimtzum (restriction) to feel the upper world? On which desires is it not necessary to do this? How do we make the Tzimtzum? Answer: We must aspire to achieve unity in a group until the characteristic of bestowal appears between us, and this will be so tangible that within it the Light, the characteristic of bestowal, will appear from above. It is not necessary to do anything beyond that! Question: How can I become a Rav in the wisdom of Kabbalah, to be your colleague in the work, both in status and in general work with the people, conducting the daily lessons and so forth? Answer: The desire is welcome. Study. #Scientists have found traces of microbes from 4.28 billion years ago–200 million years after the Earth’s crust was formed. The world’s #uncertainty and political failures prove the leaders don’t know how to lead. They need to know Nature’s Laws & to follow them. Adam was made of the earth, after all! It’s been proven that #life can arise from a synthesis of earth’s minerals and metabolites. Question: What is friendship? What are the sensations and feelings that must appear between two friends? Answer: Friendship is reciprocity, secure support, a feeling of warmth and mutual understanding. Question: Can this continue until the end of life? Have you come across such cases? Answer: Friendship between Kabbalists can be like this because it is beyond the limitations of life and death. A person begins to experience completely new sensations and emotions that are produced outside of our beastly bodies. Question: In life are there cases in which a friend gives his life for the sake of others. Is this welcomed in the wisdom of Kabbalah? Answer: The wisdom of Kabbalah doesn’t relate to this in any way and doesn’t say anything about this, neither for nor against. Everything depends on the situation. Question: Are there general rules in the Torah when a person must give his life for the sake of others and when not? Answer: In the Torah general rules and obligations like these don’t exist. But if necessary, a person himself gives his life because an inner connection can be very strong. I am convinced that there are circumstances like these in which a mother can give her life for the sake of her child. This can also be the case with two friends if one feels that the other is higher than he. Can Friendship Exist Without Self-Benefit? Question from Facebook: How can I tell whether the person in front of me is a Kabbalist? 1. Regularly studying the wisdom of Kabbalah whenever he can. 2. Studying for 3 hours during the morning lesson. 3. Regularly attending the gathering of friends’ meetings. 4. Taking part in dissemination that leads to the correction of the world. 5. Making active efforts to bring the world to a corrected state. Question: If that’s the case, even a student who is a beginner can be called a Kabbalist. Answer: According to the wisdom of Kabbalah, a person is called a Kabbalist according to his intention and his goal, not according to whether he has attained a spiritual level. If he focuses himself on it the spiritual level, it means that he is in it. Question: What are the most important steps in building a sense of feeling the upper world? Answer: The most important steps in building the soul are written and described in detail by my teacher Rabash in his first twenty articles. Therefore, I strongly advise you study them. In fact, all of the conditions required for creating a sense of the feeling of the upper world, the Creator, and His eternal and perfected state, are indicated in those articles. Question: Is there a spiritual root to feminism? Where does feminism stem from? Has it always been here or has it just emerged? Answer: Ask women around you what they really want. Don’t they really want a sense of security about the future, a good family, children, and a husband, someone to care for? This is what they need first and foremost! I don’t think that feminism did not exist in the past. It has always been here. In the past women like Cleopatra, Joan of Arc, and others represented it. Even the Torah tells us about heroic women…. So feminism is not a new phenomenon. Today we can simply see a greater breach of the ego; it is being exposed and has become uncontrollable, impossible to restrain by the boundaries of the family, the state, or the world, but this doesn’t make anyone happier. The Torah, Deuteronomy 20:20: However, a tree you know is not a food tree, you may destroy and cut down, and you shall build bulwarks against the city that makes war with you, until its submission. An infertile tree is cut down when it is possible to advance in the spiritual development with its help. You should use the tree for the movement toward the right goal: either the fruits themselves or at least something that you achieve with its help. We have different types of desires. There are desires that we can transform into useful actions, and there are auxiliary desires. This is what we are talking about. It turns out that the desire itself isn’t at fault. It simply is this way according to its nature, and later it will turn into a fruitful tree. All 613 desires of a person are located in the ten levels, what are called the ten Sefirot. Among them there are desires that can be easily managed in order to achieve the goal, and there are the passive ones that are impossible to control. They can be used only for the defensive purposes and for the advancing actions. All this is sorted inside a person. He perfectly understands his spiritual states and the forces that determine these states.